While most graduates are thinking about what kind of summer trip they are going to take or their summer job, more than 80 young men from around the Kansas City Metro are getting ready for football practice. 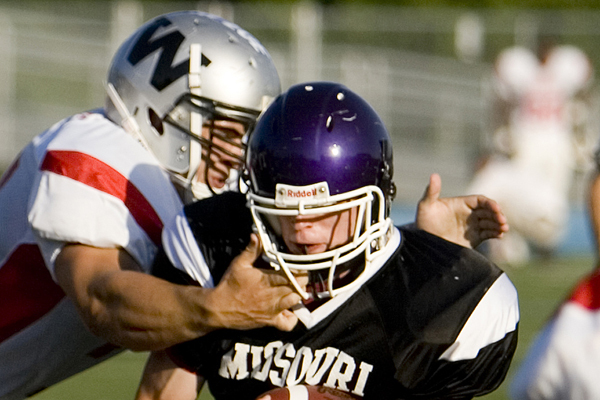 That’s because those graduating seniors were selected to participate in the Greater Kansas City Football Coaches Association Metro All-Start Challenge 7 p.m. June 17 at Shawnee Mission North High School. The game has been held since 1992 and countless of the best high school football players in the Metro have participated. This year’s Kansas and Missouri rosters feature some of the top names from last season including James Franklin from Olathe North and Camren Torneden of Lawrence Free State on the Kansas side and Raytown South’s Dennis Tanner and Darrell Jobe of Winnetonka on the Missouri side. Practice for both squads begins Monday and Kansas coach Robert Lisher of Lawrence Free State said the first task is getting the guys ready to play together. Kansas begins practice Monday night at Free State while the Missouri team will begin practice the same night at Raytown South. The Missouri team is coached by Raytown South’s David Allie and it will be looking to follow up last year’s 10-7 win with another victory. For more previews, player profiles and information about the All-Star Game keep checking PrepsKC.com in the next two weeks for complete coverage.